Devised for Gillian Collis by Patricia Hamilton with contributions from the Wembley and District Scottish Association dance class. Gillian and her husband Peter are the longest serving members of the Association having joined in 1961. 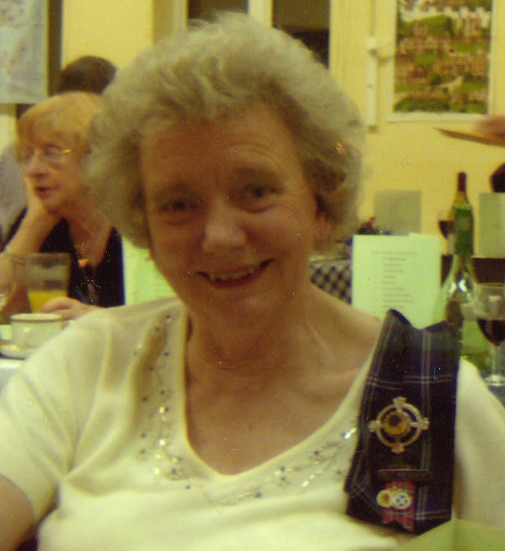 Gillian has been President twice, Honorary Secretary and, since the early 1980s the teacher of the dance class. Gillian is passionate about good cover and eye contact with your partner while dancing, and parallel reels were included in this dance for this very purpose. Gillian is a wonderful ambassador for the Association and signs her name GEM Collis, hence the title of this dance - Wembley’s Gem. Original tune: Gillian Collis' Strathspey by Ian R Muir. 1st Couple and 2nd Couple dance half rights and left. Then 1st Couple and 3rd Couple dance half rights and left. All dance parallel reels of 3 on the side: 3rd Couple (in second place) start by passing 2nd Couple right shoulder while 1st Couple cast round to their left. 1st Lady curving in on the last bar to face her partner. 1st Couple face each other while 2nd Lady faces 3rd Lady, 2nd Man faces 3rd Man for a Grand chain. 1st Couple lead up with the right hand, cross and cast round 2nd Couple into second place on the wrong side. 3rd Couple step down on bars 3 and 4. All three Couples set and cross right hand.